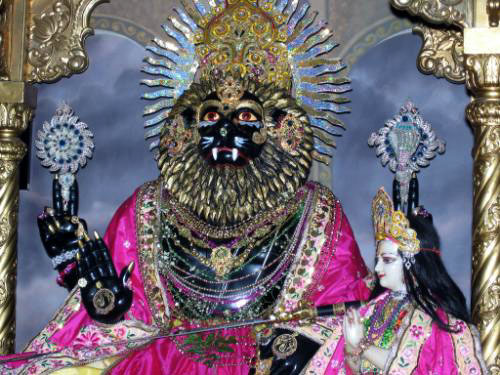 "I offer my respectful obeisances unto Lord Nrisimhadeva, the source of all power. O my Lord who possesses nails and teeth just like thunderbolts, kindly vanquish our demonlike desires for fruitive activity in this material world. Please appear in our hearts and drive away our ignorance so that by Your mercy we may become fearless in the struggle for existence in this material world." 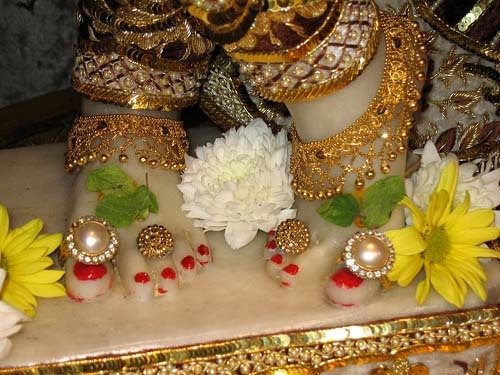 Just like a desire tree, a Vaishnava can fulfill all the desires of anyone who takes shelter of his lotus feet. Prahlada Maharaja is a typical Vaishnava. He prays not for himself, but for all living entities -- the gentle, the envious and the mischievous. He always thought of the welfare of mischievous persons like his father, Hiranyakasipu. Prahlada Maharaja did not ask for anything for himself; rather, he prayed for the Lord to excuse his demoniac father. This is the attitude of a Vaishnava, who always thinks of the welfare of the entire universe. Srimad-Bhagavatam and bhagavata-dharma are meant for persons who are completely free of envy (parama-nirmatsaranam). Therefore Prahlada Maharaja prays in this verse, khalah prasidatam: "May all the envious persons be pacified." The material world is full of envious persons, but if one frees himself of envy, he becomes liberal in his social dealings and can think of others' welfare. Anyone who takes up Krishna consciousness and engages himself completely in the service of the Lord cleanses his mind of all envy (manas ca bhadram bhajatad adhokshaje). Therefore we should pray to Lord Nrisimhadeva to sit in our hearts. We should pray, bahir nrisimho hridaye nrisimhah: "Let Lord Nrisimhadeva sit in the core of my heart, killing all my bad propensities. Let my mind become clean so that I may peacefully worship the Lord and bring peace to the entire world." "O son of Maharaja Nanda (Krishna), I am Your eternal servitor, yet somehow or other I have fallen into the ocean of birth and death. Please pick Me up from the ocean of death and place Me as one of the atoms at Your lotus feet." In another prayer Lord Caitanya says, mama janmani janmanisvare bhavatad bhaktir ahaituki tvayi: "Life after life, kindly let Me have unalloyed love and devotion at Your Lordship's lotus feet." When Prahlada Maharaja chants om namo bhagavate narasimhaya, he prays for a benediction from the Lord, but because he is also an exalted Vaishnava, he wants nothing for his personal sense gratification. The first desire expressed in his prayer is svasty astu visvasya: "Let there be good fortune throughout the entire universe." Prahlada Maharaja thus requested the Lord to be merciful to everyone, including his father, a most envious person. According to Canakya Pandita, there are two kinds of envious living entities: one is a snake, and the other is the man like Hiranyakasipu, who is by nature envious of everyone, even of his father or son. Hiranyakasipu was envious of his little son Prahlada, but Prahlada Maharaja asked a benediction for the benefit of his father. Hiranyakasipu was very envious of devotees, but Prahlada wished that his father and other demons like him would give up their envious nature by the grace of the Lord and stop harassing the devotees (khalah prasidatam). The difficulty is that the khala (envious living entity) is rarely pacified. One kind of khala, the snake, can be pacified simply by mantras or by the action of a particular herb (mantraushadhi-vasah sarpah khalakena nivaryate). An envious person, however, cannot be pacified by any means. Therefore Prahlada Maharaja prays that all envious persons may undergo a change of heart and think of the welfare of others. If the Krishna consciousness movement spreads all over the world, and if by the grace of Krishna everyone accepts it, the thinking of envious people will change. Everyone will think of the welfare of others. Therefore Prahlada Maharaja prays, sivam mitho dhiya. In material activities, everyone is envious of others, but in Krishna consciousness, no one is envious of anyone else; everyone thinks of the welfare of others. Therefore Prahlada Maharaja prays that everyone's mind may become gentle by being fixed at the lotus feet of Krishna (bhajatad adhokshaje). As indicated elsewhere in Srimad-Bhagavatam (sa vai manah krishna-padaravindayoh) and as advised by Lord Krishna in Bhagavad-gita (18.65), man-mana bhava mad-bhaktah, one should constantly think of the lotus feet of Lord Krishna. Then one's mind will certainly be cleansed (ceto-darpana-marjanam [Cc. Antya 20.12]). Materialists always think of sense gratification, but Prahlada Maharaja prays that the Lord's mercy will change their minds and they will stop thinking of sense gratification. If they think of Krishna always, everything will be all right. Some people argue that if everyone thought of Krishna in that way, the whole universe would be vacated because everyone would go back home, back to Godhead. However, Srila Visvanatha Cakravarti Thakura says that this is impossible because the living entities are innumerable. If one set of living entities is actually delivered by the Krishna consciousness movement, another set will fill the entire universe.